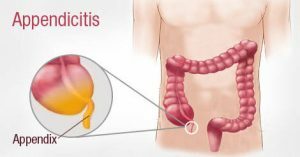 What is the meaning of appendicitis? It means inflammation of appendix (swelling and infection). The term acute means sudden development of the inflammatory process. Is it more common in certain age group? It is most commonly seen in second decade of life (adolescence), though it can affect any age group. The appendix is a blind muscular tube present at the junction of small intestines and the large intestine. 80% of cases of acute appendicitis are caused due to obstruction of the lumen of the appendix. The reason of obstruction could be a faecolith (i.e. hard faecal matter), worms if present in the intestines and rarely a foreign body. Usually the first symptom is pain around umbilicus. After few hours the pain shifts to the right lower abdomen where the appendix is commonly present. A constant finding is that coughing causes an increase in local pain. Pain is followed by nausea, fever and vomiting. Other symptoms, which might be present, are loose stools and burning while passing urine. These symptoms are then followed by a rise in temperature and an increase in white cell count (WBC). How a diagnosis of acute appendicitis is made? The features of acute pain in the abdomen, shifting to the right lower abdomen with nausea, vomiting, fever and increased white cell count indicates acute appendicitis which is the commonest abdominal emergency. There are various other conditions, which can mimic acute appendicitis. A prompt medical advice is mandatory to avoid the complications of acute appendicitis which can become life threatening, if the appendix ruptures (perforates). If in doubt an ultrasound of the abdomen helps in reaching the diagnosis. The accuracy of diagnosis has improved by USG and CT Scans. What are the complications of acute appendicitis? The treatment of acute appendicitis is removal of the appendix (i.e. appendicectomy). This can be done by an open technique or laparoscopically. Laparoscopic appendicectomy is performed by making three tiny (3-10 mm) incisions through which the telescope and instruments are introduced and the appendix is removed. The advantage of laparoscopy, over open technique, is that the patient goes home within one day after surgery with almost no pain in contrast to open surgery where the patient stays in the hospital for a longer time with considerable pain requiring injectable pain killers. Don’t we need the appendix? No, we don’t need it. Appendix is a vestigial organ in humans and thus can be removed without any consequence. Are there any side effects after removal of appendix? There are no side effects as it has no function in the human body. What if we don’t get surgery done? Surgery delayed or not done for acute appendicitis may lead to serious complications such as formation of an abscess or rupture of appendix leading to life threatening infection and even death. Which is a better procedure open or laparoscopic? Both the procedures are equally effective in good, experienced hands. However, Laparoscopic surgery has the advantage of less post operative pain, early recovery, good cosmetic results, less complications as well as the chance to rule out any other pathology present at the same time. Evidence based medical practice and all Cochrane meta analysis has proven the superiority of Laparoscopic Appendicectomy vs open. With laparoscopic approach, accuracy of diagnosis increases and if other conditions are found they can be managed simultaneously through the same incision. Lap approach offers a great advantage in childbearing women as many gynaecological diseases can mimic appendicitis.